On our journey around the globe, we started off by eavesdropping on some private conversations in Madrid, before narrowly avoiding trouble with the locals in Naples. A quick flight northwards, and we were in Iceland, traipsing over the snowy mountains and driving around the iconic ring road – with a child in tow. Then it was time to head south to Sweden and Norway, where we had a few drinks (and a lot of soul searching) with a man who tended to talk about himself a lot. Next, it was off to Germany, where we almost had mussels for dinner, before spending some time with an unusual family on the other side of the wall. After another brief bite to eat in Poland, we headed eastwards to reminisce with some old friends in Russia – unfortunately, the weather wasn’t getting any better. – Our six judges read a total of 83 books (an average of almost fourteen per person), and ten of the books were read and reviewed by all six of us. – This was our third year of shadowing the prize and the third time in a row that we’ve chosen a different winner to the ‘experts’. – After the 2012 Shadow Winner (Sjón’s From the Mouth of the Whale), that makes it two wins out of three for Iceland – Til hamingju! Love the journey, very creative literary tour of world fiction and bravo, great decision, I have downloaded Heaven and Hell in anticipation of reading The Sorrow of Angels, can't wait to get to it. The reviews were all I needed to know it's definitely something I will enjoy. And trust the shadow team's judgement too of course. I'm so glad that I was on board this year with you and the others. Thank you for the fabulous job you did organizing it all, crunching the numbers, and being patient with waiting for my scores. Each book was a tremendous read, each in its own way. What I've picked up since has paled in comparison. My reading was made richer with this IFFP list and with the discussions held with the Shadow Jury. Can't wait until next year already! Philip, I've read your comment several times…indeed, “a living, breathing, life-enriching, give and take relationship between a work and its readers” IS what literature is all about. I realize I've been terribly remiss in not acknowledging the translator in my posts. Forgive me for that, and consider it now amended. What a tremendous job you have done with The Sorrow of Angels; I stand in awe of the way you have brought the author's words to us. Philip, thank you so much for taking the time to leave such a wonderful comment here. I can only echo Bellezza and Tony's thoughts on the tremendous job you've done with these books. 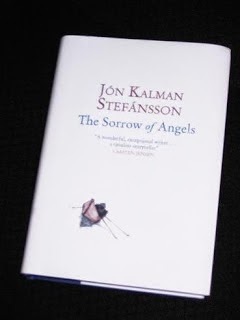 'The Sorrow of Angels' swept me away with its spellbinding, lyrical prose. The ending left me longing to read the next instalment.